Since 1980, the San Francisco Bay Area has become home to the largest community of Afghan expatriates in the United States—some 120,000—most of them living in the East Bay community of Fremont. Tucked away in that tight immigrant enclave are some of the greatest exponents of Afghanistan’s war-shattered art-music tradition. 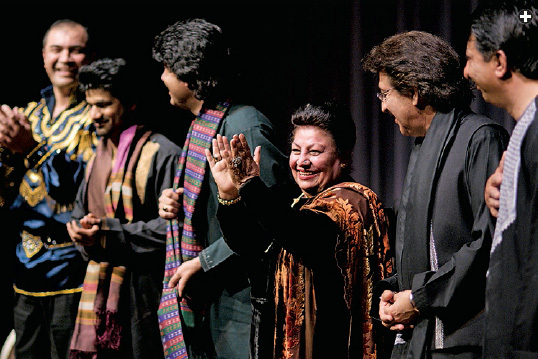 The principals in this group, legendary vocalist Ustad Farida Mahwash and Homayoun Sakhi, the young master of the double-chambered rubâb lute, enjoy iconic status among Afghans. No surprise then that a large number of Bay Area Afghans have made their way through the unfamiliar maze of the Berkeley campus to attend the concert. The rest of the house consists mostly of uninitiated, culturally curious listeners. The Afghans witness a summit of star power rarely seen at their intra-community concerts, while the newcomers experience an irresistible seduction by the passion and virtuosity of Afghan music. That allure, and the confluence of these communities, goes to the heart of the group’s mission: to give Americans a vision their country that is—to borrow a Berkeley phrase—based on love, not war.